Martwayne | Power Through Fashion: Register for the Fashion Entrepreneurship Course (Vol. 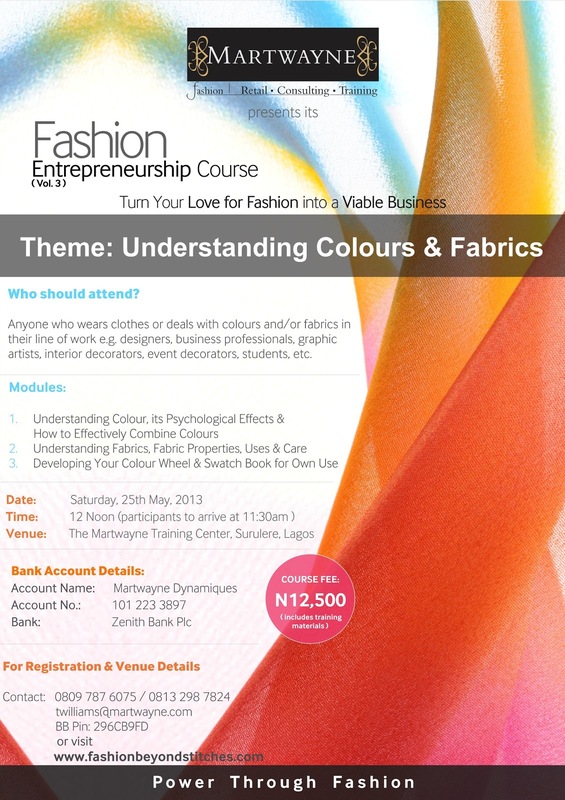 3) on "Understanding Colours and Fabrics"
Register for the Fashion Entrepreneurship Course (Vol. 3) on "Understanding Colours and Fabrics"
Hello Everyone!!! Hope you've had a good month so far! It's pretty amazing how time flies. There I was thinking I still had enough time to publicize the FEC 3 until I realized it was happening next week Saturday! Yikes! Apologies I went awol again. We have had a hectic few weeks. Amidst challenging internet service due to the rains, we have successfully ended a Level 1a stream and started another (both weekday and weekend options), started a Level 1b stream, a Level 2a stream and an FEC for Corps Members training. In addition to work schedules, I am also trying to get my act together for my big week next month! Thankfully, we have a new addition to the team so hopefully the pressure should ease out and there will be brighter days ahead! Tiny little me and my able assistant are getting completely overwhelmed with work. To those who want to see pictures of previous work done this year, hope you don't mind pictures from my phone. Somehow the camera got misplaced after our NYSC talk :-( but it is somewhere in this office. I will, however load the pictures in another post. GREAT! Thanks for the "reading eye". Now for FEC 3! Yes the theme for Volume 3 of our Fashion Entrepreneurship Course is "Understanding Colours and Fabrics". I know many people believe there's really no biggie to colors and fabrics... after all we are all fashionistas, we wear clothes everyday and many compliment us on our great dress sense. In the past, many have asked me why they need to attend a training on colors and fabrics. In response, I ask them if certain colors go with others and get all sorts of answers. Then I ask them to explain the reason for their answers and that's where many hit a roadblock. Truth is if you understand how colors work, then knowing which colors go together and why should be a piece of cake. As individuals and professionals, many of us underestimate the impact of colors and fabrics and is effects in our daily lives. Colors and fabrics go way beyond what we wear. For example, as designers, the success and otherwise of our collections are heavily dependent our colourways and chosen fabrics; as graphic artists, the colors we choose for websites and flyers are vital; as image consultants and stylists, the importance of colors and how they work with skin tones is essential; as interior decorators and event decorators, need I say more?! Show me your previous work and I'll tell you instantly if I plan to work with you or not. As business professionals, colors and fabrics in a professional wardrobe can make or break your career. Narrowing it down to fashion design, many of us, me (or is it I?) inclusive choose fabrics simply because they look nice... until we begin the work and realize they are unsuitable for the designs we have in mind. Question is how do we know which fabrics are suitable for which designs? Furthermore... and perhaps the most annoying of all is when fabric suppliers, especially those in the local market literally swear on all sorts including their cockroaches' graves that the fabrics they are selling are real and authentic. One of the Corps Members in the last set was quite disturbed when, after working on the project I gave them, realized that all the "so-called" real fabrics she bought were not so authentic after all. Bummer right?! Question is how can you tell? These concerns and a lot more are actually what we plan to teach in FEC 3. Here is a quick update on what the Course is about though the flyer says it all. Theme: "Understanding Colours and Fabrics"
Fees: N12,500 (includes training materials). Similar to FEC 2, please include your phone number in the depositor's section of the slip or in the comments section to enable us contact you with the venue details. Or better still, please send us an sms to 0809 787 6075 just in case. This worked well the last time and we prepared for the exact number of people we were expecting which was great! Thank you to those who attended FEC 2. 0809 787 6075, 0813 298 7824, twilliams@martwayne.com, BB Pin: 296CB9FD. Thank you all for your support so far. I look forward to seeing you next week. Please register early enough to enable us prepare. We have limited seats available so we need to be able to make provision for you. Great! You have a great weekend ahead and see you next Saturday at FEC 3! Hi, please when is FEC coming to Abuja?